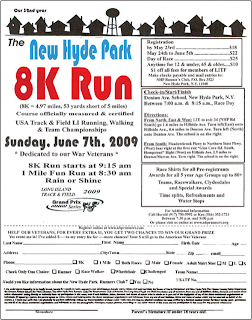 During the check-in for my 5K race there was a man handing out flyers for the New Hyde Park 8K race that's scheduled to be held on Sunday, June 7. The race is only a few towns away from where I live and my wife encouraged me to sign up. Although the application says you can register online at http://www.nhprunners.com/ the site is still set up for 2008. I tried to find more information online but everything kept pointing back to the New Hyde Park Runner's Club website. I started wondering if the event was even going to happen and I was concerned that with no online registration there would be few people participating. The race is nine days away and although I have been training for it I started thinking that it might be a good idea to start looking around for another race. 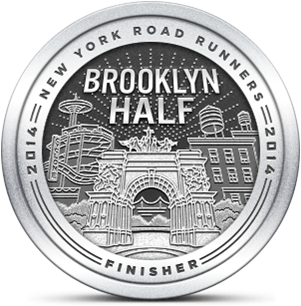 As it happened, I tried one more time to find information and saw a link to the Runner's World Racefinder. The listing had contact information, including a phone number, so I called and spoke to Harold Axelrod who told me the race is very much on but their website is having problems. I asked him how many runners he expected for the race and he said 350 to 400. That sounded good to me. Harold offered to send me an application but I already had one in paper form. I told him I'd send it in and he wished me well in the race. I'm excited that I'm back on track for this 5 mile race. I've been running about 20 miles per week over the last month and have been focusing on both pace and hills. The race starts at 9:15 on the 7th and I'm hoping that the sun won't be too intense at that time. Tomorrow AG and I are planning a long run along the Hudson (weather permitting) with a goal pace of under 9:00/mile. She's just had two consecutive weekends of highly intense competition and this will be her first run since the Patch Sprint. I'm looking to cover 12-15 miles between tomorrow and Sunday, perhaps starting with 5 or 6 on Friday.